When I wrote my first book, Design for Hackers, I came across a strange phenomenon. My writing process seemed to consist of 12 hours a day of banging my head against a wall, only to get 15 minutes of “flow,” where I would get most of my day’s creative output. It made me wonder: is it possible to be creative on command? Enter the work of Neuroscientist, Dr. John Kounios. In Dr. Kounios’s amazing book, The Eureka Factor: Aha Moments, Creative Insight, and the Brain, he and his co-author share a body of work about the neuroscience of insightful thinking. I sat down with him for a long conversation in the latest episode of my (#1 New & Noteworthy, Business category!) 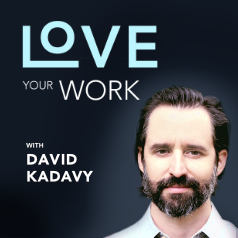 Podcast, Love Your Work. We discuss why creativity is so important to solve our world’s toughest problem, what stands in its way, and how what we know about the brain can encourage creative insights. If you’ve been wondering: should you make your bed?, Dr. Kounios shares his philosophy.